At this point, the term patient engagement is like a club, bludgeoning the healthcare industry over the head repeatedly. An individual person might not be fully aware of the importance of engaging patients in this era, but you can’t fit a whole hospital under that rock. Every provider knows the essential nature of keeping their patients, the paying customer, happy and satisfied. How they act on it, however, is another matter. With the near saturation of our population with smartphones and near instant means of communication, branded mobile apps seem to be a logical tool for providers to use. But what can hospitals do to ensure the patient engagement app connects with their patients? Following these simple steps can help take your hospital into the brighter mobile future. Delivering a valuable service with your mobile app is important. More important is ensuring that the service fills a need for your patients, and that comes down to research and determining what a patient would embrace in an app on a mobile device. Medication reminders? Proximity-based notifications? Dynamic wait times? Studying the successful features and ratings, from the many award-winning apps hospitals have created for their patients will serve to benefit your building process, as well. After researching, you need to determine what you want your app to do. Take all of the cool features that you want to include in your app and list them out. It is important not to overload the app, as too many features will dilute the app and deliver an inferior experience for the user, so choose your top 2-3 features. If you’re having a really hard time cutting the feature list down to that top tier, it may be worth considering multiple mobile apps. As the financial concerns are the top worry of hospital leaders, this step will likely loom over your app project from start to finish, and it is important to consider the entire lifecycle when planning. Not only will you need to figure development costs, but testing, marketing and upgrades will be just essential for your app and should be planned for from the outset. It’s important to remember to budget time as well as money, especially when it comes to mobile apps. A solid app versioning strategy, planned from the outset, can mitigate a lot of potential budget issues. Whether it’s done by your healthcare organization, or by an outside entity, the building process turns your app vision into a reality. Ensuring this vision is drawn up clearly and specifically through storyboarding and wireframing is essential. Further, the amount of effort put into researching, brainstorming and versioning, will also help determine the ease of the building process. Throughout building, your app should be tested continuously on real mobile devices to ensure the best experience for your users. 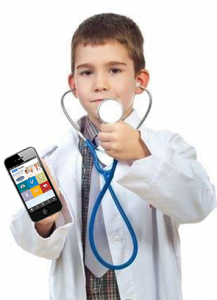 With a fully functioning and deployed app, your task is to get it on your patients’ phones. Physician recommendation is a proven way to persuade patients to use a health app, yet only 1/3 of doctors recommended an app to their patients last year. Getting physicians at your hospital to share your app with patients will give the app a huge boost. Further, continuously interacting with patients, through pushing relevant notifications, updating content and features, and making your app work for them; will also help ensure that your patient engagement app makes in onto your consumers phones and sticks there. Even after your app is built and deployed, you should be looking for ways to improve upon it. With the dynamic nature of technology and evolving patient needs, the need to upgrade, or version, your app will happen sooner than you think. Repeating these steps will ensure that your Patient Engagement App 2.0, and all subsequent versions, build off the success of the first. With the easy building experience and full app lifecycle management capability of the MobileSmith app development platform, any hospital can easily implement this proven step-by-step process to deliver a captivating mobile experience for their patients. Patient engagement doesn’t have to be painful; it just needs a little app-reciation.